Barely a month after Leslie Cheung’s (张国荣) memorial concert, many Hong Kong celebrities will gather for Lydia Shum’s (沈殿霞) upcoming commemorative concert. 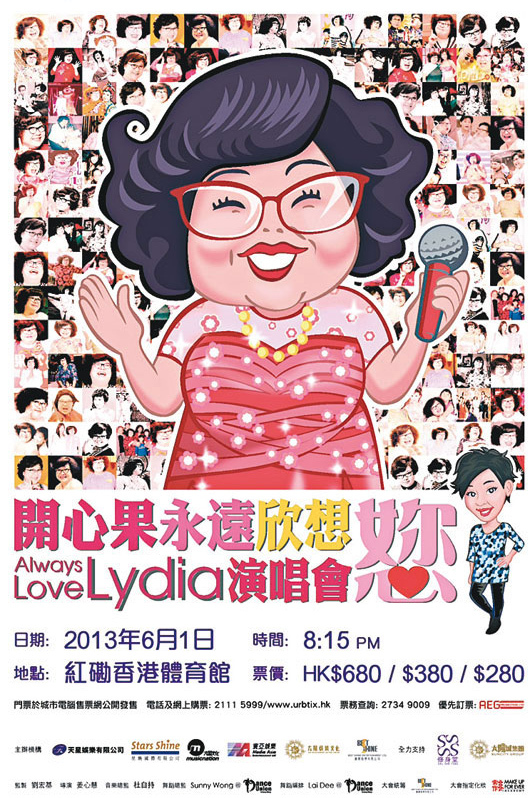 Marking the 5-year death anniversary of Lydia “Fei Jeh”, the concert will be held on June 1, 2013 at the Hong Kong Coliseum. Eric Tsang (曾志伟) also took it upon himself to be the convener, gathering Fei Jeh’s good friends together for the concert. 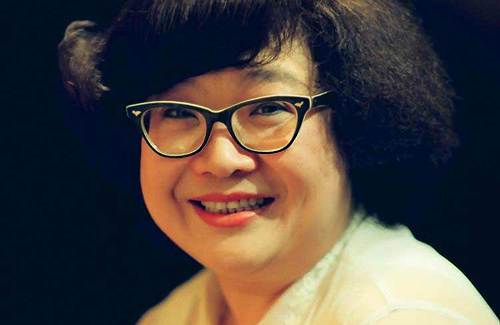 Joyce Cheng (郑欣宜) will also fulfill her mother’s dream by performing at the Coliseum. In 2008, Fei Jeh who had been suffering from several medical conditions, including liver cancer, was taken off life support after her condition worsened. She passed away peacefully with her loved ones by her side on February 19, 2008. Fei Jeh’s celebrity friends, such as Eric, Liza Wang (汪明荃) Carol Cheng (郑裕玲) and godson Jacky Cheung (张学友), will gather for the concert. Taking into account the recent tragedies in China and Boston, they hoped to inject positive energy and good cheer to audiences. Since Fei Jeh is known for her laughter, the concert organizers hoped to bring back memories of her sunshine personality. 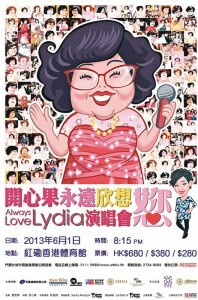 The “Always Love Lydia” concert <开心果永远欣想妳演唱会> will be held on Fei Jeh’s birthday on June 1. Consisting of 2 concert segments, the first part will be filled with performances by good friends such as Jacky, Liza, Nat Chan (陈百祥), Richie Ren (任贤齐), Emil Chau (周华健), Nancy Sit (薛家燕), Teresa Cheung (张德兰), Bowie Wu (胡枫), Lo Hoi Pang (卢海鹏), and Grasshopper (草蜢). The stars will also share their personal experiences with Fei Jeh. For the remaining 30 minutes of the concert, Fei Jeh’s only daughter, Joyce Cheng, will fulfill her mother’s dream and perform at the Hong Kong Coliseum. The list of accompanying singers who are appearing in this segment has yet to be finalized. Mr. Tse reiterated that the intention of the concert was to remember Fei Jeh and not to make money. He made a rough estimate that even with a sell-out show, the event will still lose over $20,000 HKD. As a result, they are now looking to cut down on production costs. Mr. Tse also used the opportunity to thank many superstars for performing without remuneration. He stated further that even if there is any profit, Eric will ensure that it will be donated to charity. Tickets for the concert are already open for sale and the poster, which uses a collage of Fei Jeh’s joyful expressions and caricature, gives off a cheerful vibe. It’s been 5 years already?! Definitely doesn’t feel that long. I can still remember her laughter clearly. I think this concert will be a very nice tribute to Fei Jeh. I’m personally looking forward to this concert — not just because of the stars who will perform, but mainly because I really miss Fei Jie and would love nothing more than to see her dream (of her daughter being happy and succeeding in the entertainment industry) fulfilled. Joyce getting the chance to perform at HK Coliseum — even if only for 1/2 hour — is truly one of the best tributes that everyone who loved Lydia could possibly give her…. i gotta agree with you. Felt the same for Anita Mui. Still misses her very much. Haha, i bet some killjoy are gonna complain they are using fei jeh to make money too! Yawn. Wow, so instead of posting something constructive, you post flamebait. I hope this isnt gonna bethe same rumor for the last one they held for Leslie concert and Eric Tsang already said the money will go to charity!!! It’s a long story…basically, Adam was involved with his current wife (Koon Jing Wah) throughout the time he was dating Lydia and even after they married. Not long after Joyce was born, Lydia finally put her foot down and refused to tolerate the infidelity anymore — she divorced Adam and took up the responsibility of raising Joyce all by herself. For the longest time, Lydia was so pissed (rightfully so) that she didn’t even want Adam in her presence (hence the reason why he went to ATV and Taiwan/China after they separated and only returned to TVB when Lydia left). It wasn’t until the year 2000 or so when Lydia decided to finally forgive Adam for her daughter’s sake…. Anita Mui is having a tribute concert? I’m surprised to hear this, given how her mother is. Yup…there were talks of doing one this year because of the special 10th anniversary milestone. Personally, I doubt it’s going to happen though, given that her mother has already threatened to take action against anyone who dares to do a memorial concert…unless the mother drops dead between now and then (which is highly possible given her age)….